Mister Soandso was born in Virginia, and lived for five years in Texas before moving to Minnesota. The good news is he and his family never embraced lutefisk. Instead, they made year treks back to Texas for barbecue. These are some people who know barbecue. Or at least the best places in Texas to roll up your sleeves, tuck a napkin in your shirt, and get your BBQ on. Fast forward my entrance into his life. I grew up in a world that owned a Webber. It was that thing in the yard where my parents would attempt to create as thick of a carbon coating to the outside of raw meat. Back in the 70s and 80s, the northwest (or at least the parts I frequented) wouldn’t have known a barbecued rib if it smacked it in the face. But I’ve learned from Mister Soandso a few things about ribs. They are the meaty goodness version of chili. Or chicken soup. Or meatloaf. Or whatever other dish you can think of that has as many incarnations as folks making it. The only rule is that it must bear enough likeness to the average example as to be recognized as such. When one of my writer friends commented on my plan to make ribs, I told Diana Paz that I would share with her my recipe. Which was cruel of me because I approach most things that don’t require a leavener with a rather capricious air. However, I am a woman of my word. So here it is. 1. Wash and pat dry a rack of ribs. Using a sharp knife, remove the visible fat and membrane covering the bones. (I’ve skipped this step without any issues). If I was a smartie, I would have lined this pan with foil first. But I didn’t. Clean-up will be interesting. 3. Let rest/come to room temperature. This is important. Too many folks cook cold meat. This never works like you think it should. Since these ribs will be baked, it’s not a major deal breaker, but you might as well get into the habit because it will be summer again one day and these babies will be going on the grill then. Preheat your oven to 225 degrees while you’re waiting. 4. Pour about 16 ounces of either beer or apple juice into the pan and cover it with foil. 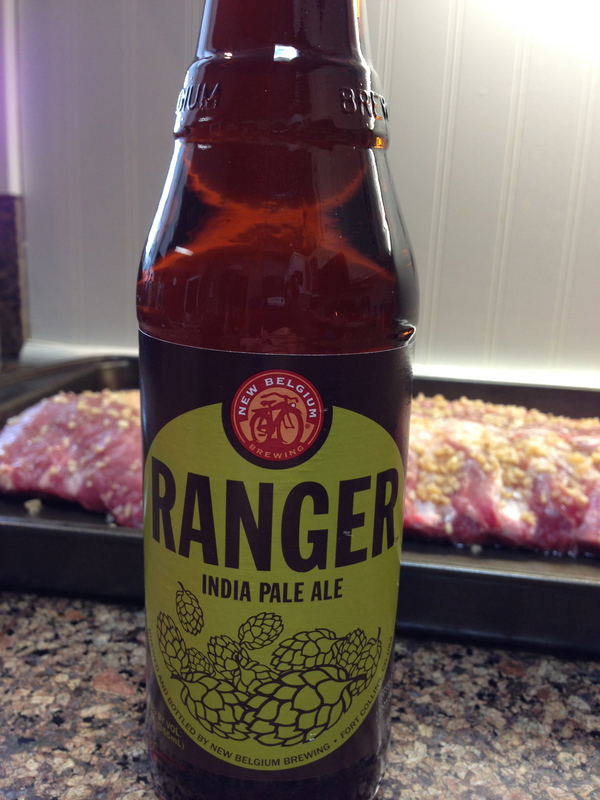 These ribs are baked until they are ready to fall off the bone and you need some moisture to make that process work. Either beer or apple juice work well – just use a beer you wouldn’t mind drinking. The apple juice won’t change the flavor although some folks might swear they taste a sweetness. They are just trying to sound smart. Cover with foil and carefully put onto the middle rack in your preheated oven. 5. Bake for about 2-3 hours or until the meat reads about 160 degrees or the meat looks pretty close to done. 6. Now is when I get a little playful with my ribs. 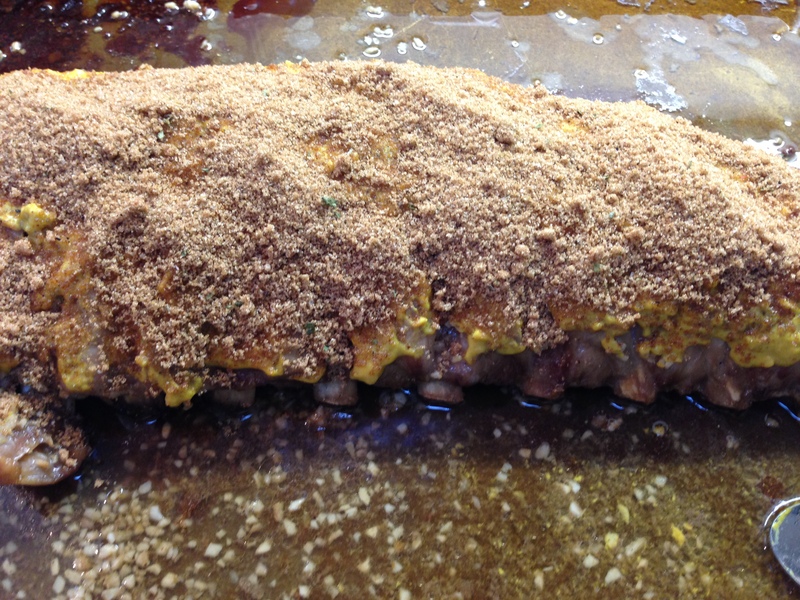 Cover the cooked ribs with a nice coating of plain yellow mustard. Don’t be insane about the process, but put on enough mustard so the rub will stick. In this case, the rub was one that Mister Soandso whipped up last summer. You can Google a pork rub – as long is it has a brown sugar base, it will look like this one. I sprinkled on a pretty good coating of the rub — mostly because I wanted my container back. But the fact is, this is going to get melty/crispy/yummy and you don’t want to skimp. Alternatively, you could just put a thick layer of your favorite barbecue sauce on the ribs. 7. Return to the oven and bake, uncovered, for about 30 minutes or until the rub turns sugary. If the rub just doesn’t want to cooperate, you can drizzle some pan drippings over it, recover with the foil, or decide it looks fine how it is. 8. I top with a bit more barbecue sauce right before serving because Littlest really likes barbecue sauce. 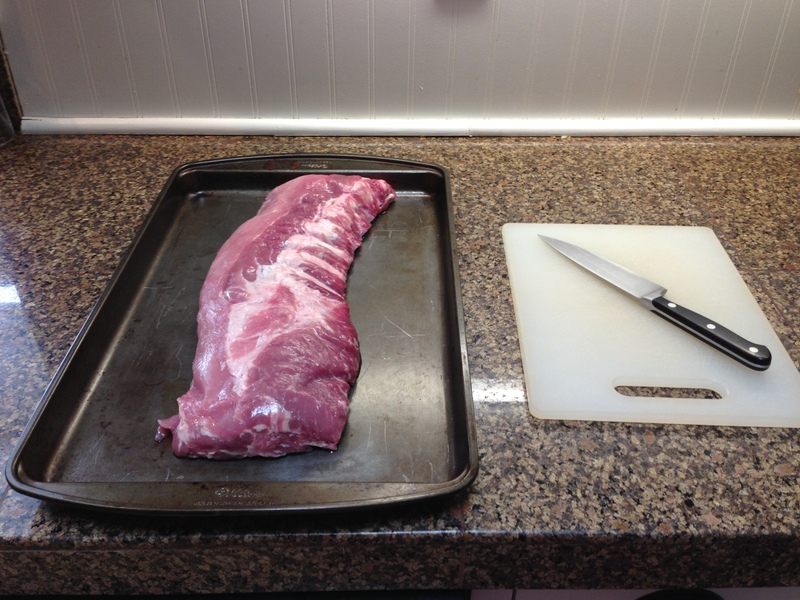 Let rest for a few minutes, slice into single or double rib servings, and serve. In the summer, I serve with classic summer sides (corn on the cob, green salad, potato salad, et cetera). But on this rainy northwestern day, I served up some sautéed kale and mashed potatoes. Alrighty then. I told Diana this would work. I suppose I should have paid better attention to measurements and such things. But really, long and low heat, some liquid to keep it moist and some seasonings…how can anyone go wrong? Even if they don’t know a rib recipe from Adam. 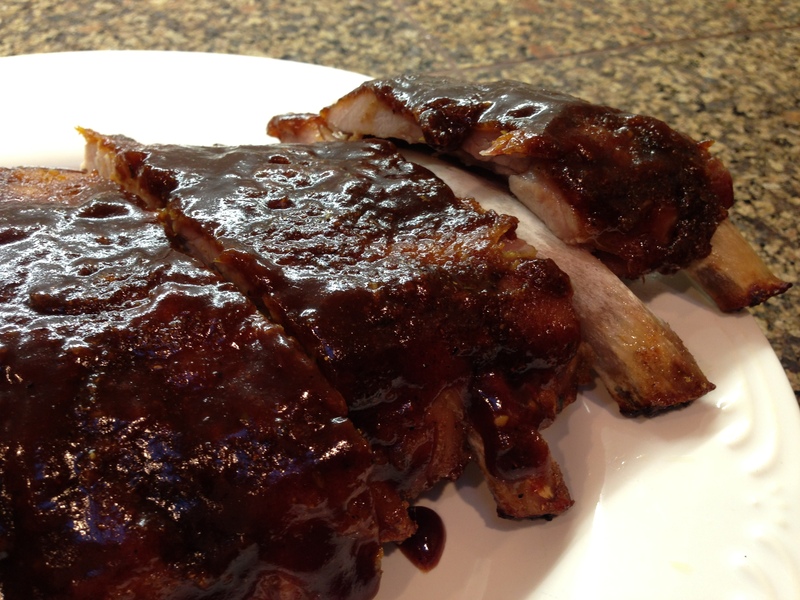 This entry was posted in Front Page, Recipes and tagged baby back ribs, cooking, Diana Paz by kristina. Bookmark the permalink. So glad you have a new yummy thing added to your cooking repertoire of greatness! May there be many happy rib meals in your future! Holy God in heaven, I am SALIVATING. Yay! Time to turn the oven on!!! This time of year makes me want to bake stuff – a warm kitchen equals a warm heart. Sounds great! I’m notbnormally a fan of “messy” foods, those being any food more likely to end up on my person as in, but this sounds worth the possible embarrassment. I know, I’m hopelessly uptight about things that, seriously, one one cares about. … And I obviously can’t tiny-touch screen-type today either. G’ah! Oh yum. Yummy yummy yummy yummy yum. I’m going to try this. Yay!!! Let me know how it turns out! Oh, these look amazing! Will have to try your recipe!